Al's only release ever nominated for a Grammy for a children's recording. Al's only collaboration with composer Wendy Carlos, although he would later approach her with scoring UHF. Wendy wasn't available, so Al went with veteran film composer John DuPrez. As can be seen above, the LP plays each side as continuous tracks, yet the CD has separated every part of each "story." STILL NEED THIS ALBUM? FEELING LUCKY? THEN, TRY ORDERING IT FROM PRIVATE SELLERS AT AMAZON! 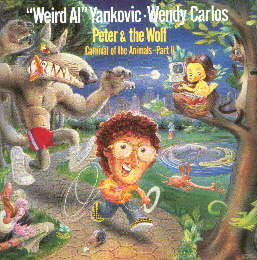 Peter And The Wolf ©1988 CBS Records.